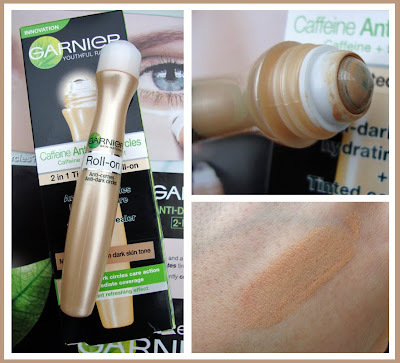 B U B B L E G A R M: Garnier 2 in 1 Tinted Eye Roll On! Garnier 2 in 1 Tinted Eye Roll On! Garnier have launched a tinted version of their popular eye roll on. It aims to act as a normal eye care treatment whilst concealing dark circles and delivering a illuminated, hydrated smoother surface. It contains caffeine and lemon extract and a UV filter but no SPF. It comes in the same packaging as the green eye roll on but in a champagne colour. It has a metal rollerball applicator to massage whilst applying the product. The formula of the roll on is surprisingly pigmented and light feeling. It applies quite smoothly, the texture is light and easily blendable. It only comes in two colour choices, fair or medium/dark. What's that about, there needs to be one for a chocolate skin tone! (Garnier take note!) I have it in medium/dark which is a very close match. It has some warm tones in it which counteract the blueness under the eyes. I only applied a little bit! I dabbed it in with my ring finger and this was the result. It looks quite rested, don't you think? I think that this product is rather clever, as it eliminates the usage of 2 products under the eye area. 2 in 1 products are great for travelling and I think this will come in quite handy. I was sent this product for free, however I was not paid. I mention this at the end as I don't feel that it's that important as it doesn't affect my opinion. I would have purchased this anyway as I'm curious like that! It sounds great, will have to give it a go. It's surprises me how some brands still struggle identifying the need for an in between colour, but you're right it is a pretty good match and the fact that its warm based is even better. Will be trying this out. Wow... the black and white photo of you down the side of your blog is amazing. You have a really pretty face, classic beauty look if you know what i mean :) Your hair looks great in this photo, how was it done? Interesting product! I may have to try it! ohhhh this looks good, my only gripe tho is as its a treatment product you would apply it to bare skin, so wouldnt your foundation 'wash away' the concealer?! Great review... great pics too! Really shows off the true color of the product!! Looks really good on you! I may give this one a go. The only thing that puts me off is that I don't really rate the regular eye roll on. It never seemed to do anything! I don't think that I have ever used Garnier skincare but at the moment, the name seem to be everywhere. I like this idea of a 2in 1 and there looks like there is quite a bit in the tube and it could last a while?! @essjay23x yes I think it would last a while. I keep seeing ads for this on the subway and have been wanting to try it. I think it'd be good for days where I'm feeling lazy and didn't feel like doing much make up. I didn't know it came in a tinted version too, I'll have to look out for this! Hemen denemem lazm, çoook merak ettim.. Uzun vadede treatment etkisini gördün mü? I should give it a try immediately, I'm really curious.. Did you notice any treatment effects in the long run? Now I 'm REALLY intrigued...! Ok, deep breath, this should come here in about 10 months...lol! most of the time, I feel like I'm doing damage to my undereye area because I wear concealer everyday. I'm sure this product will eliminate the guilt by a great deal! Thank you for this post. I hadn't seen this product yet and I'm dying to try it now. I always loved the under eye roller from this brand it felt so great on my skin every morning. I can't wait to try this. My under eye circles are the main reason I wear make-up at all. I'm convinced that if they weren't an issue I'd only wear a faint bit of mascara and eye shadow with some blush. Thank you for the review and images! I think it's a great product. I have a review on the light one, and a video on youtube too which you can access from my blog, in case you want to see the other shade.Hugs everyone.